Suitable for 7 to 8 year olds, this course is designed for young children who have some or no previous experience with making computer games. The students are taught how games are coded as they create a new game. Then each child is encouraged to build their own game, progressing at their own speed. NOTE: Your child must have already attended a free Taster/trial session or an after school club to attend this course. 7-8 year olds. Is your child ready? Our courses cover attainment targets from the new National Computing Curriculum. This fun activity is suitable for beginners and younger children. It involves creating games using Scratch and Garageband. 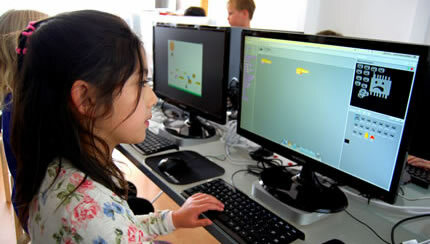 Students are taught creative coding techniques, and are then encouraged to put into practice what they have learnt. Subjects taught include animation, image creation, loop based music production, character and object control, and coding skills. Teaching content is tailored to challenge and improve each learner's existing skills and knowledge. Learners are continually assessed to establish the level they are working at and to stretch them. 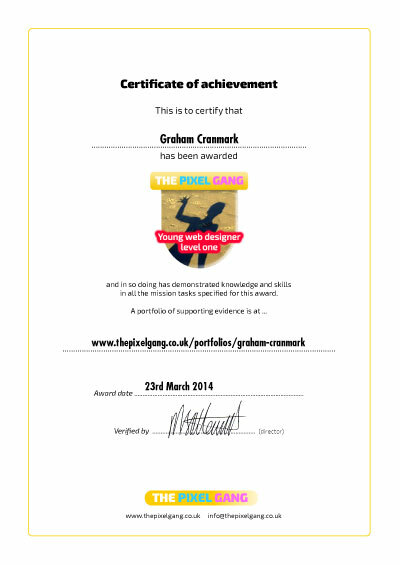 Our activities are accredited with Pixel Gang Certificates. To earn a certificate learners must complete certificate tasks. First time? Unless your child attends a school at which one of our code clubs is running, we ask that you bring them to a free Taster of Trial session first before booking an activity. Try some of the games and videos our students have made. They're a lot of fun! Find out about the hardware and software we use.